If you’ve noticed, Christine Coleman over at Aaron Miles’ Fastball has been doing a countdown over at her site as well. So often we seem to wind up with the same players, even when they might not be the most obvious one. So I looked over the list and thought I’d try to go a bit more obscure than the obvious choice. There were plenty of names to choose from, as seems to be the case as the numbers get smaller. I mean, you have Porter, who was a World Series MVP but also a troubled soul with substance abuse problems. That’s an interesting avenue. You have McCarver, whose playing career has been somewhat overshadowed by his broadcasting one. I’ve really enjoyed him on FOX Sports Midwest and I’m glad that he’s expanding that footprint this season. We remember Furcal, of course, and the part he played in the last championship run. You could even talk about Matt Holliday‘s 2009, when he wore the number when he came over from Colorado (via Oakland), or Jon Jay, who started with that before moving to 19. Lots of different stories there. But, when it came right down to it, I couldn’t pass up on Jimmy Ballgame. (It helped that Christine assured me she’s going in a different direction today, which should be fascinating!) If nothing else, because it gives me another chance to post this. It’s still fairly unbelievable that the Cardinals got a talent like Edmonds for a pitcher that’d just had a career year and a minor league prospect. Sure, Adam Kennedy did have a decent career in the bigs, but what the Cards got out of Edmonds in like two years about made up for all of Kennedy’s career worth. (I’m not looking things up so I’m probably exaggerating. Slightly. Probably.) 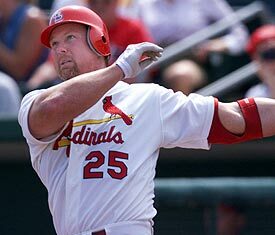 Edmonds was part of that legendary MV3 and that sweet left-handed swing has yet to be really be duplicated in St. Louis. I enjoy watching Matt Adams swing the lumber, sure, but it’s not quite as silky-smooth as the centerfielder’s was. And the defense. Oh, my, the defense. Ask the Reds, whom he stole home runs from in back-to-back games one series. Ask the Astros, who probably end their World Series drought a year earlier if he doesn’t make The Catch. Ask pretty much anyone who played in the National League from 2000-2007. 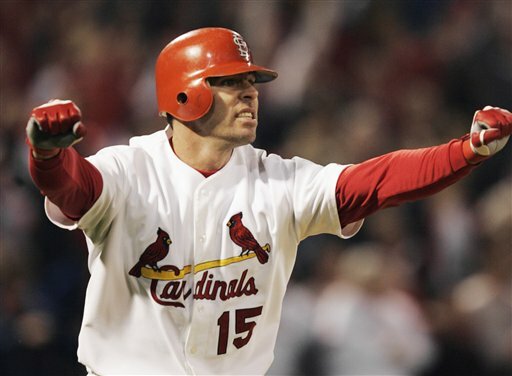 It’s amazing that a team that had Jim Edmonds and Scott Rolen in their primes on the same field ever had a ball hit the ground or a runner reach base. It’s probably telling that this epitome of California flash and cool is now a beloved icon in the Midwest. You don’t get to be in the inaugural Hall of Fame class for an organization if there isn’t a lot of love there and it’s obvious the love goes both ways, as Edmonds makes a home in St. Louis and has been involved in both the restaurant and the radio scene in the Gateway City. We may never see his kind again, but I’m so glad we have these memories to look back on.